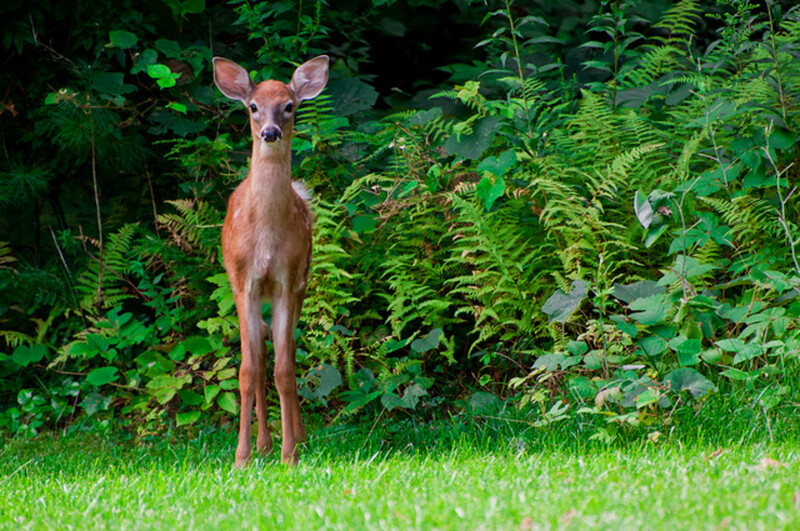 Do You Need Deer-Resistant Plants? Deer are graceful animals and I love having them around. 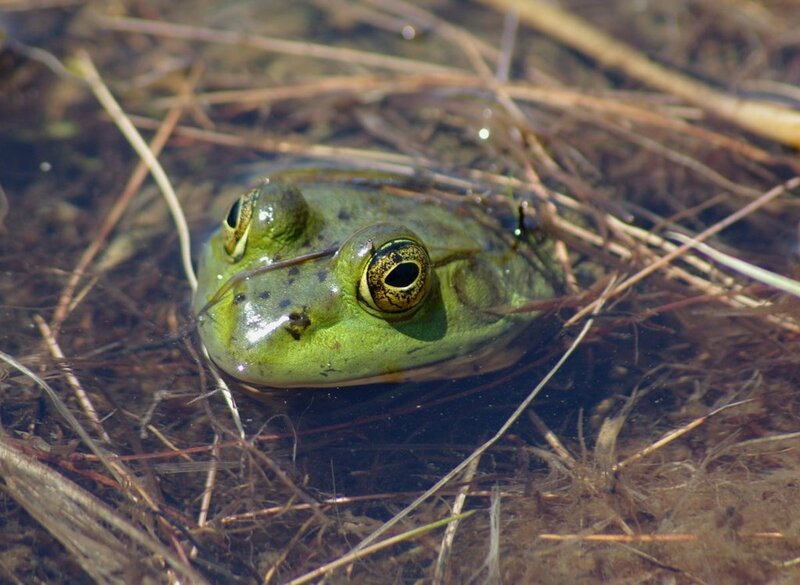 We have them near our home and it's not uncommon to wake up and see one or two in our yard or very nearby. Like so many things though, they can be a nuisance. 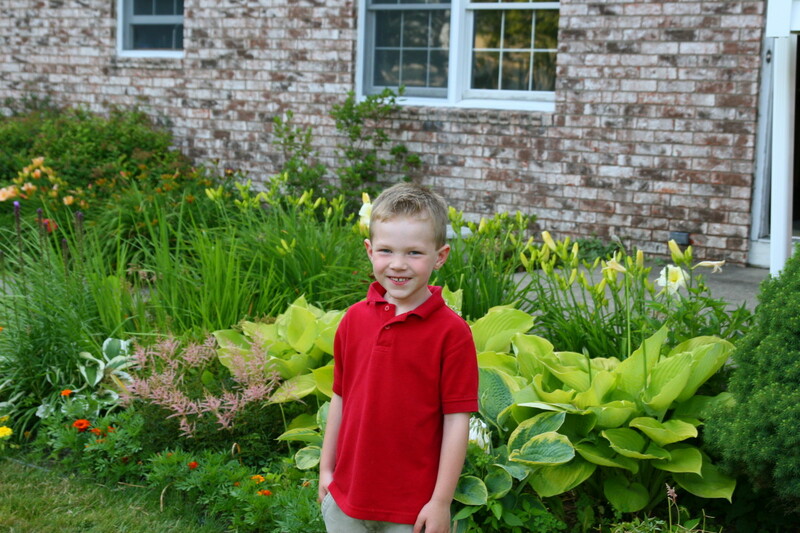 For anyone who gardens or likes to landscape their yard, the ever-present danger of total annihilation is always on their mind. Deer can destroy thousands of dollars of plantings or many years of labor in a single night. 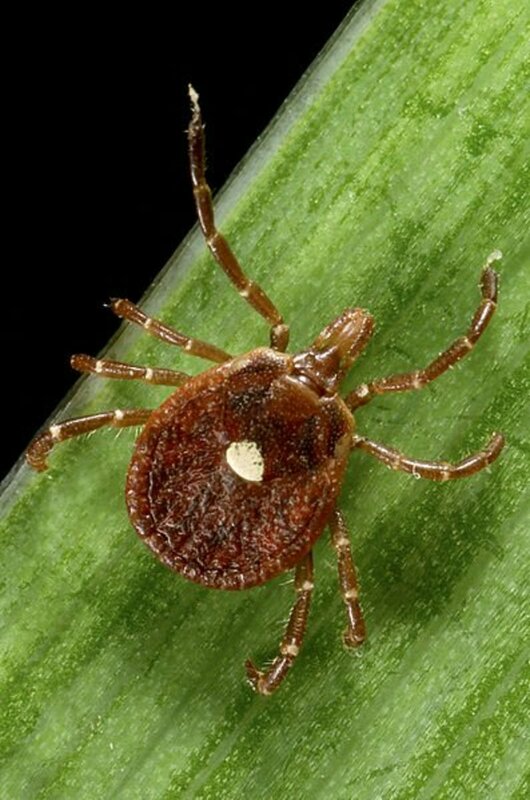 Sure, fencing and other repellents help. I suppose having large, aggressive outdoor dogs might be a deterrent also. I have two cats that strike fear in the hearts of squirrels, chipmunks, rabbits, and even many birds, but deer are another story. In fact, I would say they have a bit of a mutual admiration society going on between them. 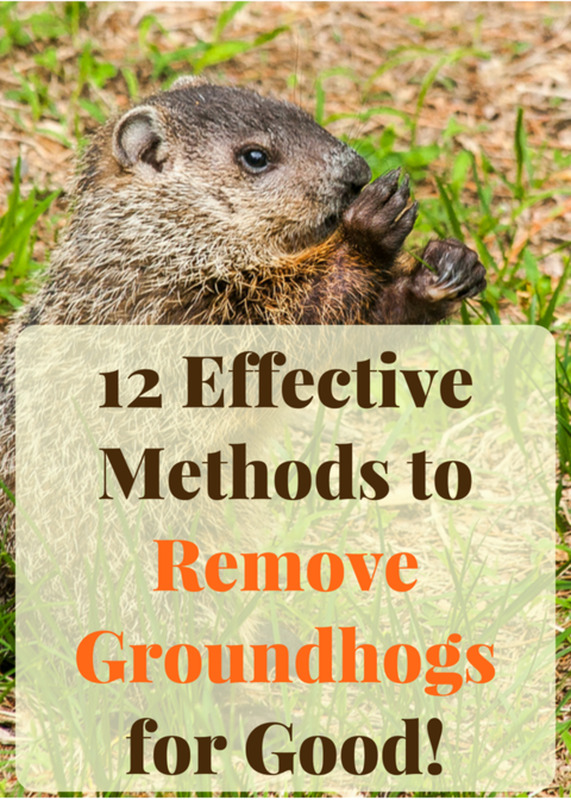 However, it's not impossible to greatly reduce the possibility of plant loss to deer. It's fairly easy to use deer-resistant plants—those items that don't appeal to deer—to prevent catastrophe. On this page, I'll share information about some of the deer-resistant perennials I've used where I live in Indiana. 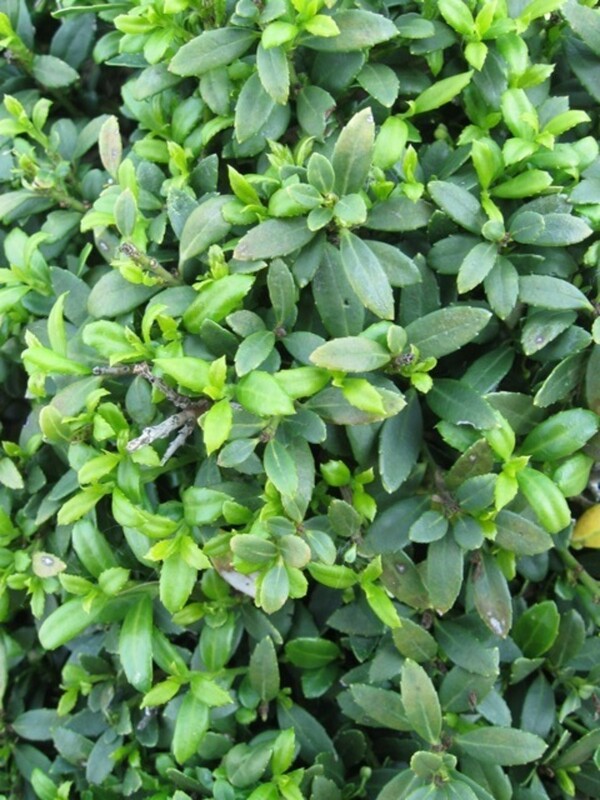 One of the more prominent deer-resistant shrubs in my landscaped area is Green Velvet Boxwood. 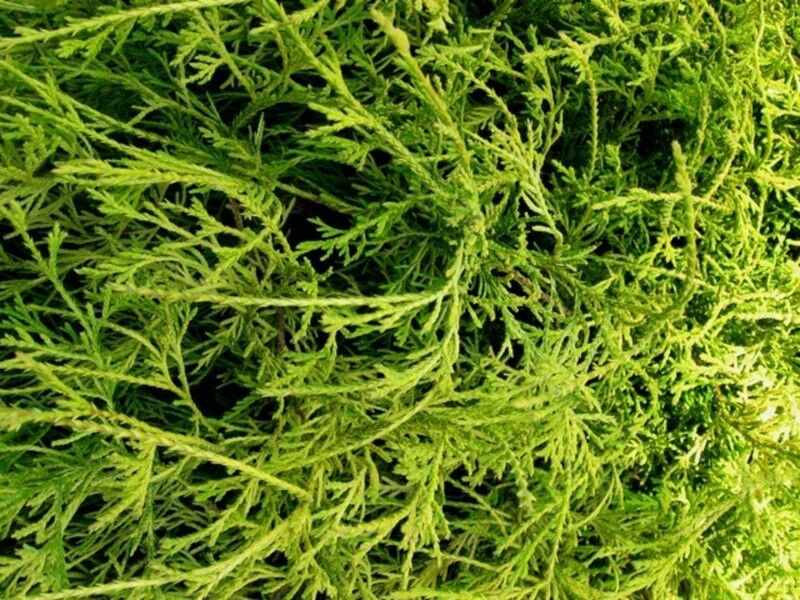 They have small deep green foliage that has an even softer, more 3-dimensional look, in spring when new growth is a brighter, yellowish green that contrasts with existing foliage. It has a gently drooping presence when foliage first appears but the shrub maintains its shape rather well when allowed to grow without other plants impeding it. I have planted these shrubs in both sun and partial shade with success. They seldom need watering or any type of pruning and grow moderately fast. I have dozens of daylilies in a rainbow of colors. They are perfect in the sun and are a great deer-resistant flower. I know that deer can eat these plants, but apparently, they don't prefer them because although I have the daylilies planted right next to the edge of our "lot", next to a cornfield and adjacent to a woods where I frequently see the deer, they remain untouched. 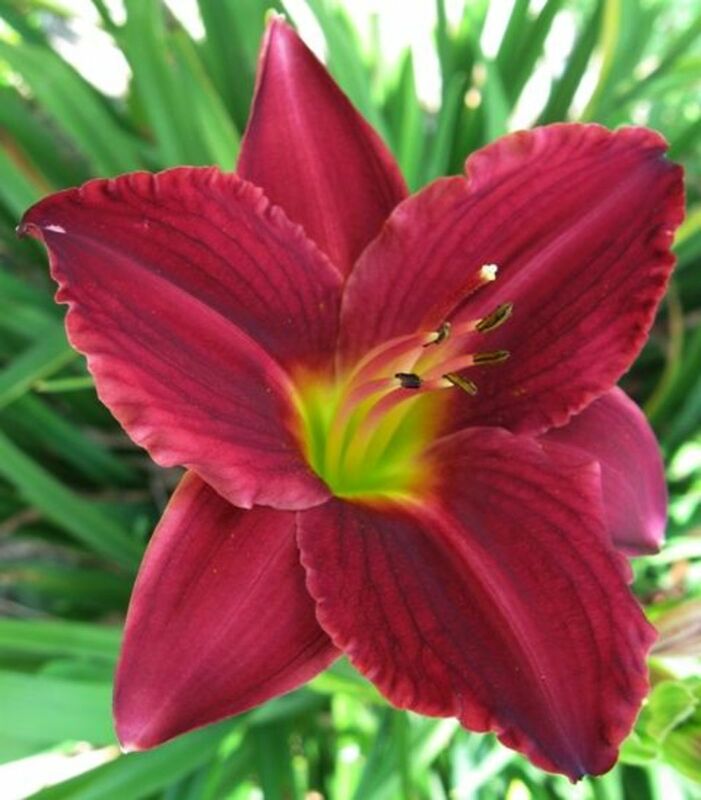 I do have a few daylilies planted in partial shade and they grow adequately but don't bloom as vigorously. They are perennial plants and bloom repeatedly during the summer. Mine can bloom as early as the end of May through as late as early September. They come in a wide variety of colors; yellows, oranges, reds, pinks, purples, and so on. Daylilies seem to grow vigorously. I planted most of mine when they were a single "fan". Now 5 years later, they've already had to be divided and I'm in the process of dividing some of them for a second time. In the early spring before blooming, they come up quickly and give the appearance of ornamental grass. In the late fall, I remove the exhausted growth and nothing is visible all winter. I first planted creeping elfin thyme in some pots I had. It spread quickly and cascaded over the edges of the pot making a pretty display. Once I completed more landscaping I found I had areas that needed some good ground cover. I selected more creeping thyme and it has served me well. This groundcover seems to be another good deer-resistant plant. It's never been disturbed. 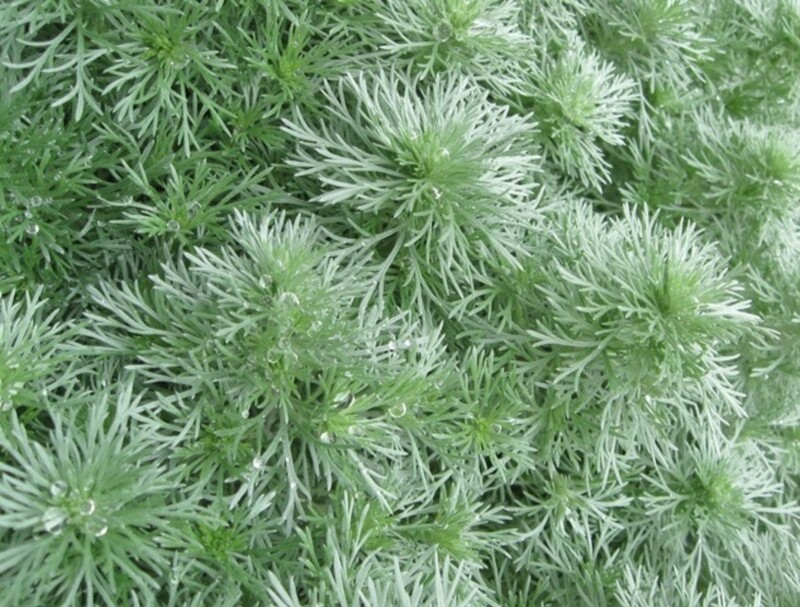 Mine only grows an inch or two high and creates a beautiful carpet of tiny, dark green leaves. By June it usually blooms with tiny pink and crimson flowers, and by late summer it begins to take on a deep crimson color which it holds until spring. It's never boring. Mine is planted in full sun for 75% of the day and tolerates moderately dry conditions. When I had it in pots I watered it every couple of days and it tolerated 50% shade. These shrubs provide a great deal of color in the form of their "evergreen" golden foliage. They almost shimmer sometimes. They are another deer-resistant shrub that I've used in my landscaping. Mine are planted in well-drained soil and receive full sun at least 9 to 10 hours per day. I assume that they tolerate really poor soil, as mine were planted in a sandy area that was created when my house was under construction and the contractor did not remove the excess sand. I did not amend the soil and merely put them there just as an experiment. It's worked well for the past several years. I rarely water them except under the most extreme dry conditions. 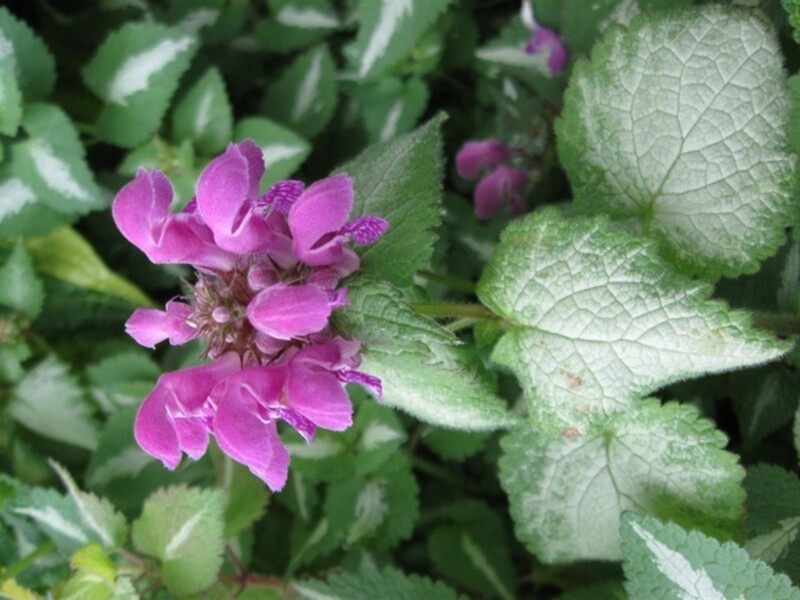 I have some Dead Nettle planted in a shady area (partial shade) with well-drained soil. It hasn't spread excessively and has interesting foliage. 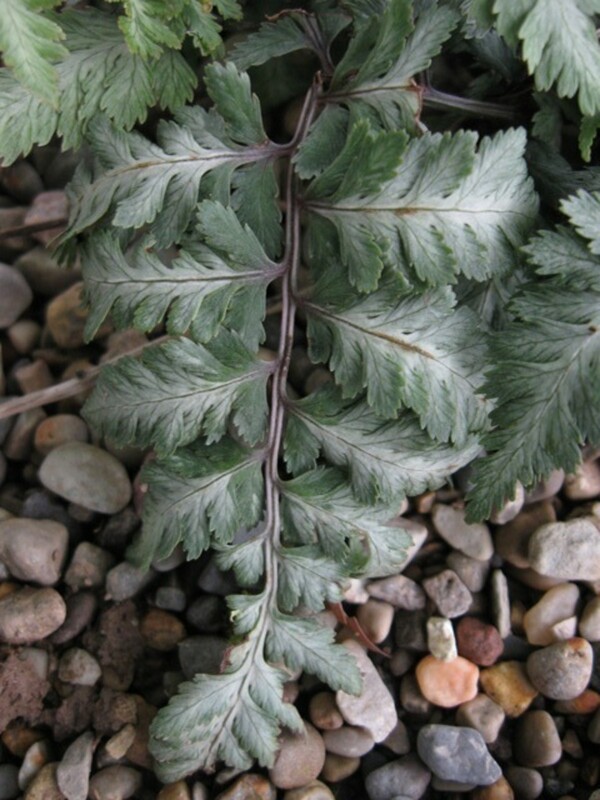 Some of it has medium green heart-shaped leaves that are silver/white with green trim while another variety merely has silver running down the center vein of the leaf. Both have tiny pink blossoms. Mine has only grown about 5-6" high and a single plant covers an area of about 24-36". It adds interest and can cover bare spots well. I've never seen any signs of deer disturbing this plant either, although it's certainly in the path they travel through my yard at times. 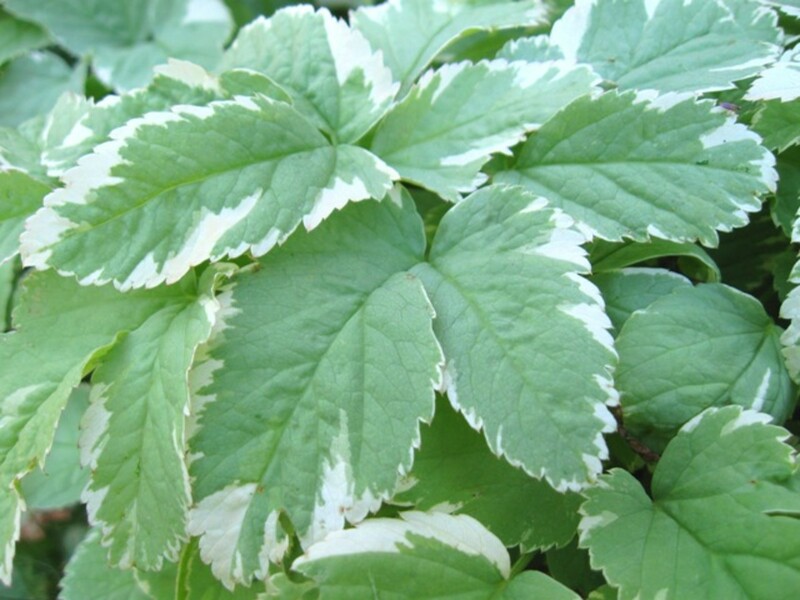 This deer-resistant plant is great in mass plantings and it's variegated foliage adds a lot of visual interest. It requires no care other than trimming it back. It grows no taller than 15-16 inches but it spreads rapidly and, I'll warn you, it can be invasive. You want to plant it in an area where it will be contained, such as someplace bordered by a sidewalk. Typical landscape edging does not keep it in place. 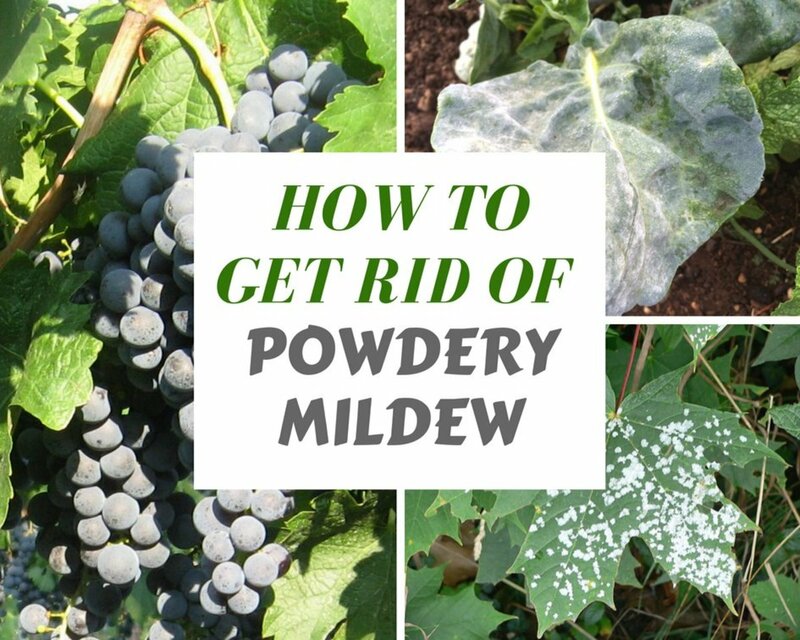 It has white blooms that erupt once it reaches a mature height and I recommend keeping those cut off to help avoid spreading. Although I think this is typically considered a sun-loving plant, mine has shade for about 40% of the day and it thrives. It has tolerated droughts, withstood foot traffic, and is just an overall hardy plant. There are a number of ferns that are known to be deer-resistant plants and I've certainly made use of a number of them in the shady areas of my lawn. Cinnamon ferns and Christmas ferns have flourished, but I have a handful of Japanese Painted Ferns that are probably my favorites. 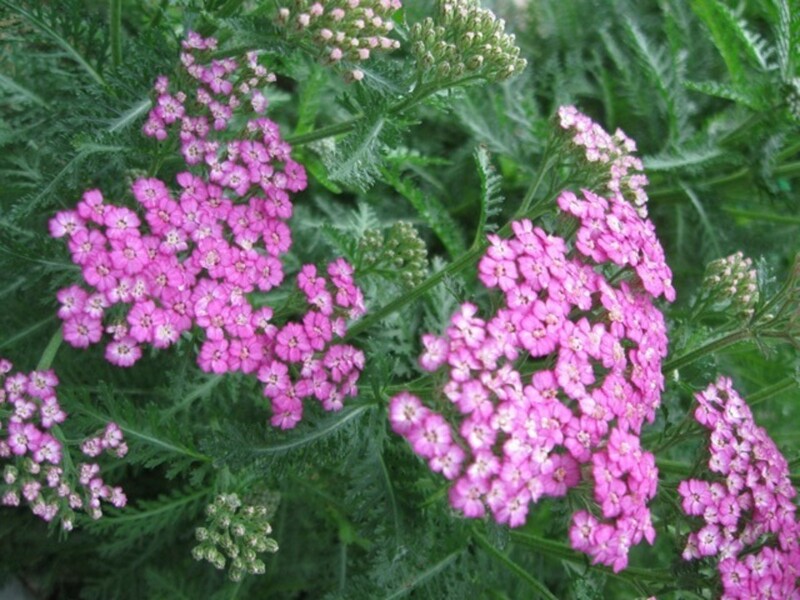 Mine are planted in well-drained soil and have moderate shade most of the day. I do have to water them throughout the summer as they prefer soil which is moister than what is available at that time of year. The picture I took here was captured in the early spring before the fern had reached its full size, but mine only grow to about 10-12 inches in height each year. 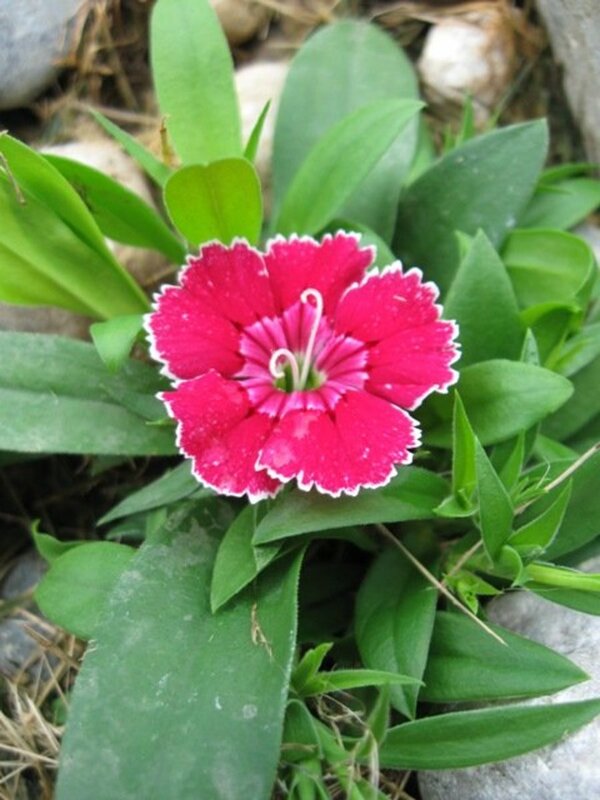 I have a few plants of Barbarini Dianthus. They've grown to about 12" in height and are covered with red blooms and have dense green foliage that grows in clumps. I also have some other Dianthus shown here that's planted near some shrubbery. Both seem to like well drained soil and appear to be deer-resistant plants as well. Up close, dianthus blooms are lovely, with 4 frilled edge petals that bloom throughout spring and summer. I water mine lightly once or twice a week only during dry spells. They have tolerated temperatures as low as 10 degrees below zero during winter. Mine get approximately 6 to 7 hours of sun each day. I have 3 silver mound specimens (Artemisia) planted in a well-drained area that sees probably 9 to 10 hours of sun each day and they thrive. They are very round and grow to be about 12 inches high and 2 to 3 feet across. It's very rare that I water them. I cut them back in late fall leaving only the woody stems. They do have a strong fragrance at times and can activate my allergies if I cut them. However, I think this fragrance is part of why silver mound is a deer-resistant plant. I love the contrasting silvery green when planted next to deeper colors. 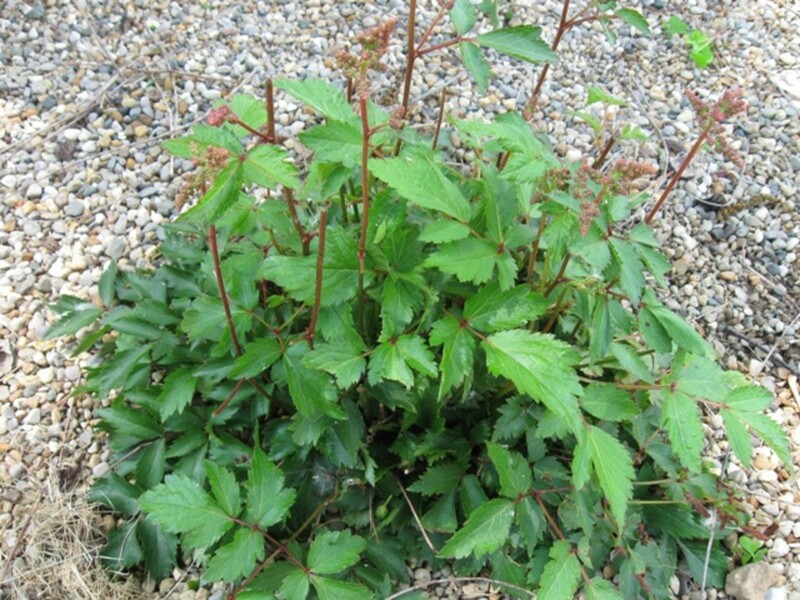 Astilbe is a small flowering plant which also happens to be deer resistant. 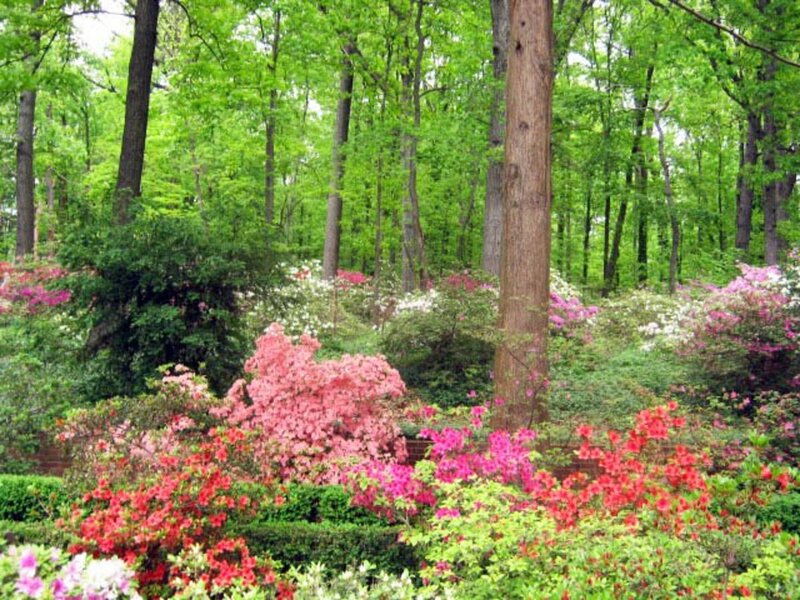 It forms mounds of green foliage in spring and begins shooting forth blooms in late spring or early summer. With the blooms extended above, my Astilbe reaches a height of 14-16 inches. I planted mine in a location that receives shade about 50% of the time and they grow moderately well. They have been low maintenance although I keep them watered every 4 or 5 days in drier weather. It grows fast and can spread a bit, but I don't consider it wildly invasive. Mine has grown 18 inches tall or so. 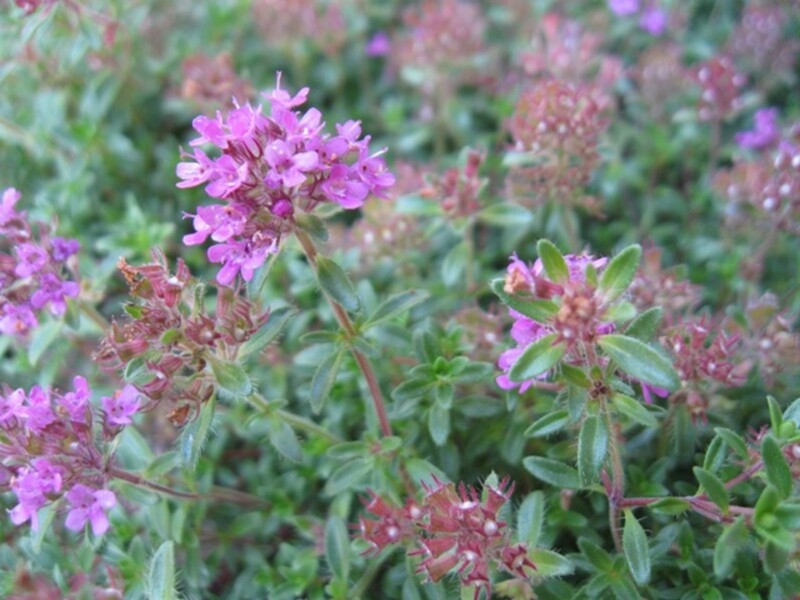 It has feathery green foliage and tiny flowers that grow in flat clusters at the crown. Mine is bright red and pink. 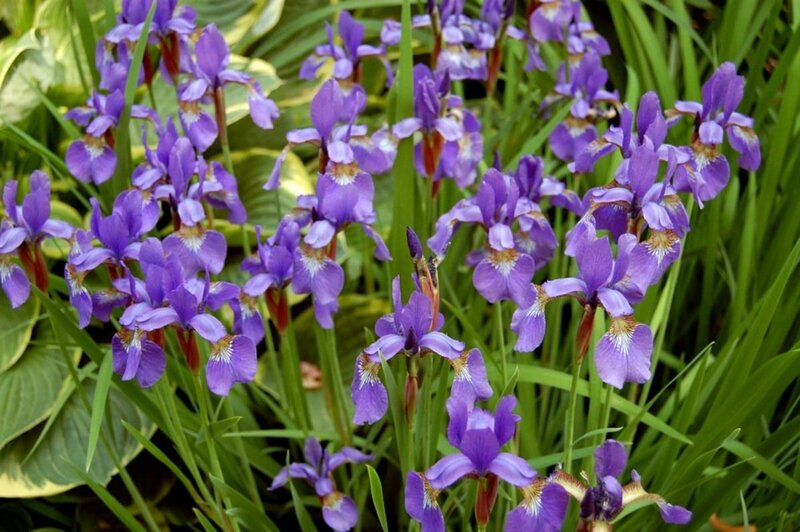 They generally start blooming in May and have exhausted themselves by mid to late August. I do cut mine down to within 6 inches of the ground at the end of fall. 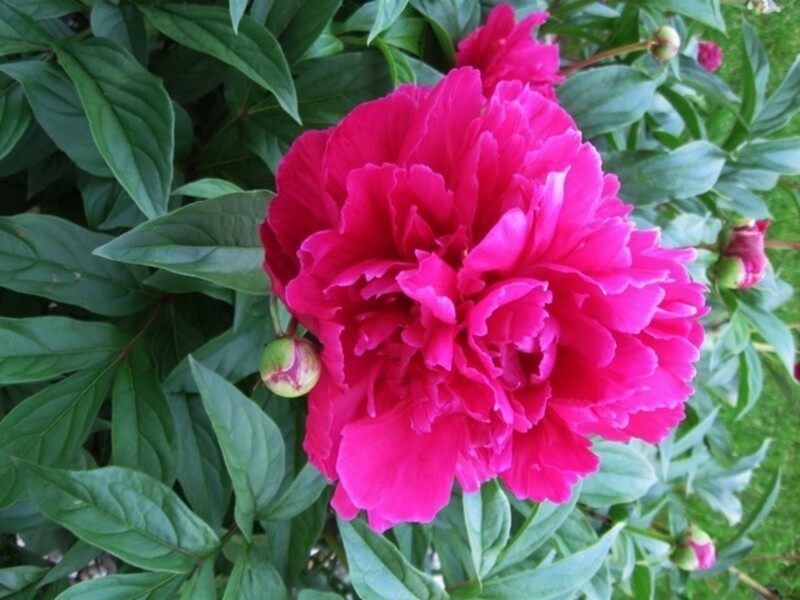 Another deer-resistant flower that I have in my yard are a few peonies. I planted them as bulbs so it took a couple of years for them to really grow into a large plant with numerous blooms. Like the daylilies, I have to assume deer would eat them if hungry enough, but they must not be too tasty, because although deer visit us regularly, my peonies are all intact. My peonies are planted in well-drained soil but they only get about 6 hours of sun each day. They seem to bloom primarily in May. I water them once every week or 10 days during excessively dry periods and prune exhausted blooms. I cut off all of the foliage in late fall. Other than this they receive no special care from me. I have my Coral Bells planted in a partially shaded area to protect them from the long sunny afternoons that are common during the summer. I water them only once a week during dry periods and they tend to like well-drained soil. This photo was taken in the spring when they had just emerged a few weeks before. They are a deer-resistant plant, and the 3 specimens I have planted have never been bothered by passing deer. I know there are a number of varieties related to coral bells that offer other colors. 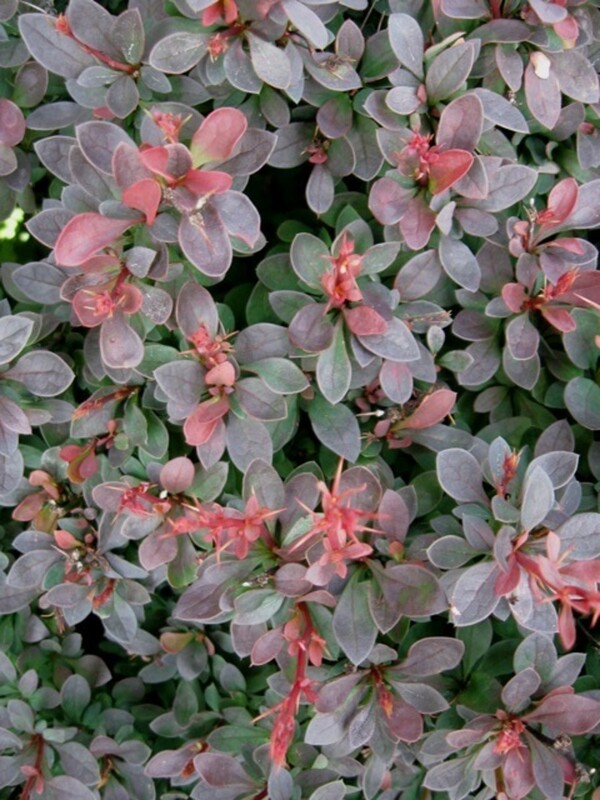 Barberry is a natural deer-resistant shrub. It's the thorns I believe. These deciduous shrubs add a nice burgundy color to the landscaping and hold their shape with minimal trimming. Mine are planted in full sun for about 8 hours a day with shade in the evening. They also have well-drained soil. I have only watered them three or four times in the past few years and then only under the most extreme of dry conditions. The only downside to these shrubs is, of course, those thorns. If you need to work around them, you'll want to wear gloves and long sleeves. It has a rounded shape and I believe it will get to about 2 to 3 feet in height although after a few years mine are only 8 inches high and about 12-14 inches across. 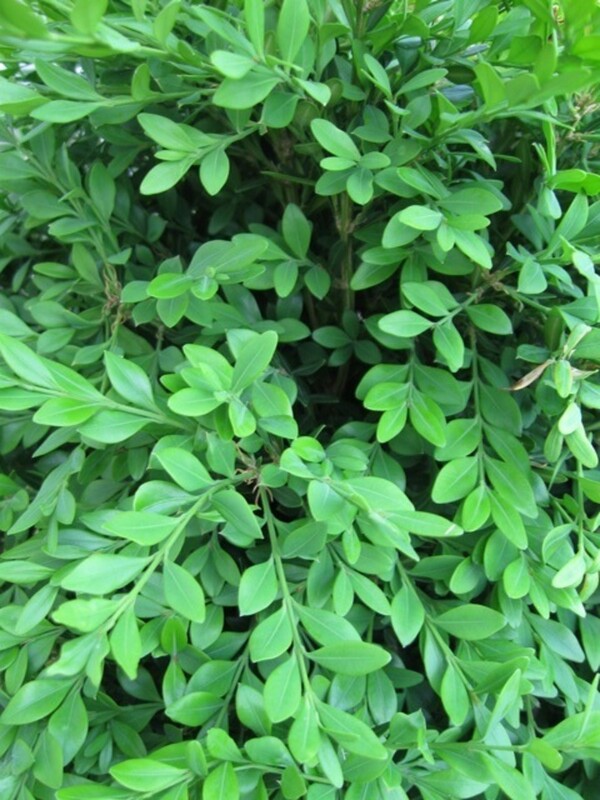 The leaves are quite small and compact, they are fairly soft, glossy and deep green. 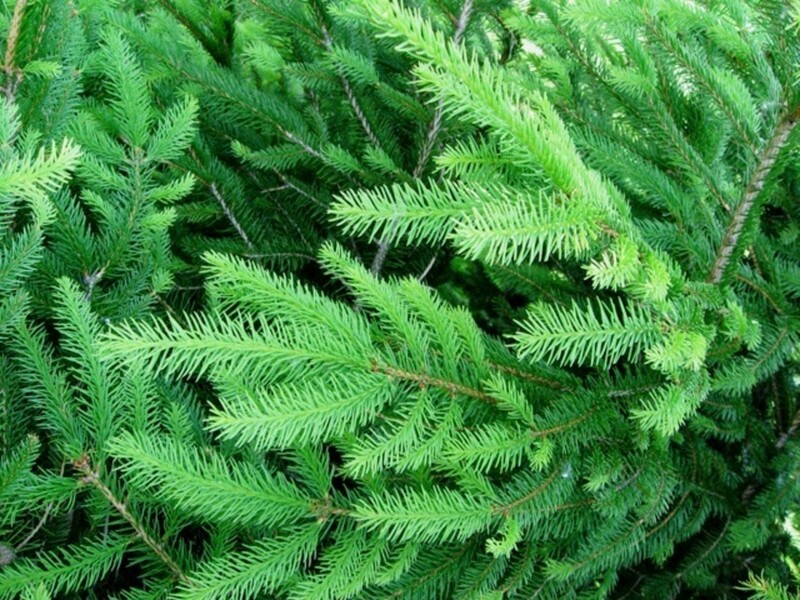 Due to their prickly nature and their strong aroma, spruce trees, in general, don't make for a good meal, so they are certainly a deer-resistant tree. I felt this was important primarily when they were smaller as I bought them quite small to keep the cost down. Certainly, they grow to a massive size; up to 25 feet wide and 65 feet high. 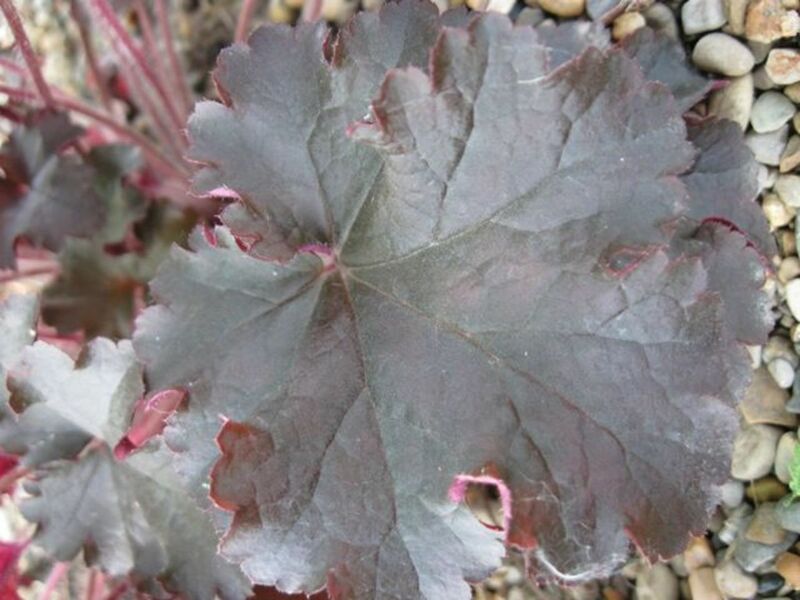 Mine is planted in full sun and has a steel blue color with more of a greenish color in older sections. The newest growth in spring is a very light, vivid blue. They provide a great contrast to the green of most other tree foliage. They aren't as rapidly growing as some of the other spruce trees available. The only pest I've had to be concerned about with these trees are bagworms, but I was able to manually remove the "bags" in the late summer/early autumn and then treat the tree with an appropriate pesticide the next spring to be sure they were gone. A Norway spruce provides a nice color contrast with the Colorado Blue. They are a deeper green and have beautiful soft, bright green new growth each spring. They are fast-growing spruce and at full maturity can easily be over 100 feet tall. 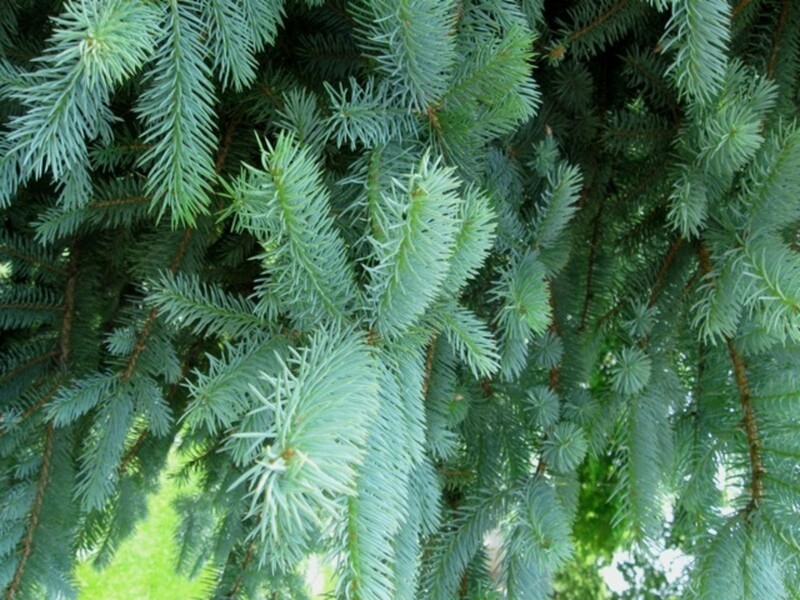 Like other spruces, a Norway spruce is considered deer-resistant as well. Again, mine are planted in full sun and well-drained soil. Once established they've required no care except for treatment to rid them of Japanese Beetles one year. These insects appeared to be capable of stripping the needles off of the tree and potentially killing it. I've also used a number of ornamental grasses that the deer have not bothered. However, I have no photos of them at this time and I'm unsure of which varieties I now have. You can find some deer-resistant ornamental grasses here. I do have a number of other plants that I've used around my yard that are not considered deer-resistant plants. 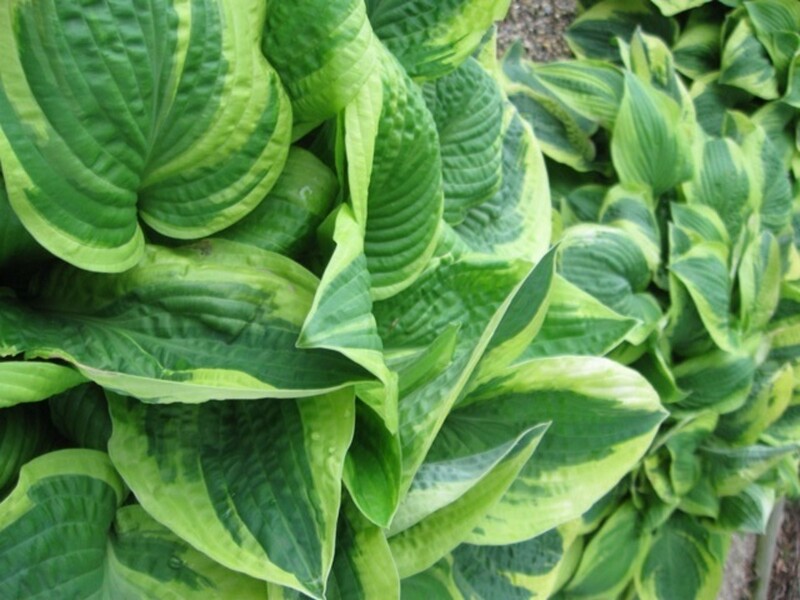 Hosta is one of these. I've used hosta as well as a couple of Japanese Maples in shaded areas and I've not had problems with them. However, in both instances, they are planted near the house; actually near both my house and my neighbor's house and away from the area where deer tend to enter my yard from the woods or surrounding fields. For other plants that aren't designated as deer resistant, I am very selective about where I plant them. I reserve containers or pots for any of the flowers that seem to be on the menu for deer. Petunias, pansies, and so forth survive only up by my doorstep. Perhaps this, paired with the fact that I've surrounded these more enticing plants with deer-resistant ones helps keep disaster away. Deer also have not bothered any of my trees. I have sweet gum, a variety of maples, an oak, and an ash tree. I've had only one small branch broken off but apparently, it didn't suit the palate as it's never been bothered again. I grow the snow on the mountain under big pine and maple trees. It seems to brown out on 90 degree days if it gets afternoon sun. The deer haven't bothered it at all. The deer love eating my tulips, I'll have to try some of these other plants. 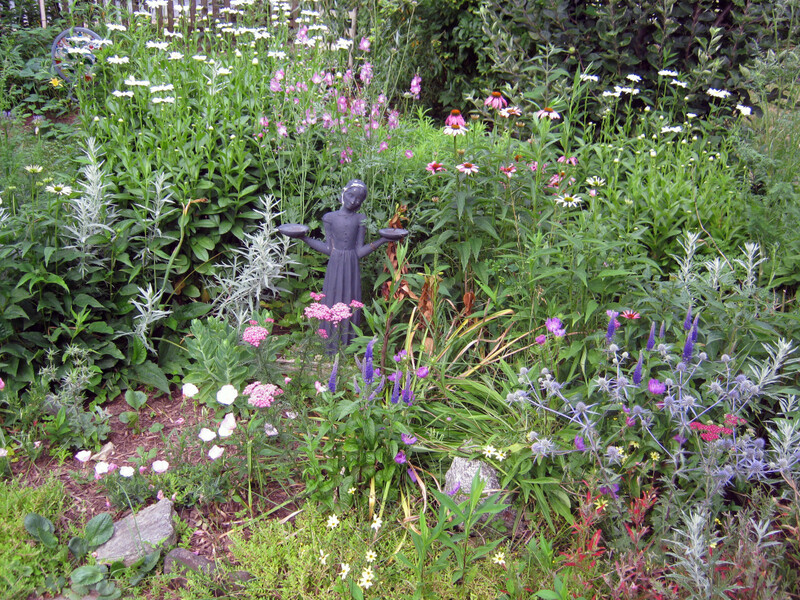 It sounds like you have learned to coexist with the deer quite nicely and still have beautiful gardens! No fooling, this is a wonderful lens. I'm in your neighborhood for only today and I'm leaving a blessing from the Angel of Farmyard Animals. Wool from sheep dotted all over the garden keep them away too. Do not clean the wool - use it newly cut. I had to laugh at the thought of your cats trying to scare off the deer. This is a good list of deer resistant plants.